Just how high does the boy wizard fly in the year's most anticipated movie? Peter Mountain / Warner Bros.
Robbie Coltrane is anxious. "I've had visions of being chased by millions of children who thought I got it wrong," says Coltrane, the Scottish comic who plays the giant groundskeeper, Hagrid, in Harry Potter and the Sorcerer's Stone. "They're chasing me up Fifth Avenue. 'There's the guy who ruined Hagrid! Let's get him!'" Memo to Coltrane: I have seen Harry Potter, and there's no reason for you to hire bodyguards. When the film opens on Nov. 16, lovers of J.K. Rowling's Harry Potter series who have worried about what Hollywood had in store for the sacred text will be relieved to see that Coltrane's Hagrid bears an impressive resemblance to the gentle giant Rowling described in the first volume: He's a lovable lug  funny and slightly sad  with "long tangles of bushy black hair and ...hands the size of trash can lids." And just as he does in the book, he makes his entrance on a flying motorcycle, with a baby in his "vast, muscular arms." Harry has arrived, and he has arrived in good health. I flew to London and saw the film two weeks ago, before any critics (including TIME's) were allowed to see and review it. Now it can be told: with Harry Potter and the Sorcerer's Stone  the first film in what Warner Bros. hopes will be a long and profitable franchise  director Chris Columbus has bravely gone toe to toe with the imaginations of readers who have purchased 100 million Potter books and made the boy wizard one of the most beloved figures in literary history. (The author, once a struggling single mom in Edinburgh, Scotland, has become an international celebrity since Harry Potter and the Philosopher's Stone, as the book is known in Britain, was published there four years ago.) The big-screen adaptation is a film of such eye-popping grandeur, dazzling special effects and sumptuous production values that you may not notice right away that supporting characters like Peeves, a troublesome ghost, and Piers, a troublesome boy, have been given the heave-ho. But these visuals serve what is essentially a greatest-hits compilation of the book itself, from the snake that winks at Harry in the zoo to the owls that swoop through his school, Hogwarts, dropping mail on the magically gifted boys and girls; from Hogwarts' Great Hall with its soaring night-sky ceiling to the cavernous vaults and Munchkin-size goblins working in Gringotts bank (keep an eye out for Verne Troyer, who played Mini-Me in the 1999 Austin Powers sequel); from the wizard's version of chess, in which queens and knights come alive and beat each other senseless, to the Quidditch field, where young witches and wizards on broomsticks fly through the air playing a magical hybrid of basketball and soccer; from Hagrid's baby dragon to the 12-ft.-tall mountain troll (both computer generated), who wreaks havoc in the girls' rest room; from the teetering magic shops of Diagon Alley to the secret Track 9 3/4, where students board the train to Hogwarts. "Fans would have been crushed if we had left too much out," says Columbus, whose adaptation runs a whopping 143 minutes. "My mantra has been, Kids are reading a 700-page book. They can sit through a 2 1/2-hour movie." The book he is referring to is Harry Potter and the Goblet of Fire, fourth in the series, which was published last year (at 734 pages, to be exact) and currently holds the record as the fastest-selling book in history  at least until the fifth Potter, which is expected in 2002. Says Columbus: "Instead of trying to overtake the readers' imagination, we've just given them the best possible version of the book, which means steeping it in reality...I wanted kids to feel that if they actually took that train, Hogwarts would be waiting for them." Indeed, from the moth-eaten tapestry of the dormitory common room to the well-worn Sorting Hat, which divides the first-year Hogwarts students into houses by reading their minds (as in the book, it speaks to the students and assigns Harry to Gryffindor house, but it does not sing), Sorcerer's Stone does have a dusty verite. Lest we burden Sorcerer's Stone with expectations too great, however, we must note that it is not a perfect movie. Critics will certainly point out that the book is a more transporting piece of entertainment. (The movie assumes a sometimes too-heavy load in its ambitious attempt to bring all the novel's most memorable elements to the screen.) And child actors often require some patience on the part of viewers. Sorcerer's Stone marks the movie debut of Rupert Grint, 13, and Emma Watson, 11, who play Harry's friends Ron and Hermione. Daniel Radcliffe, the 12-year-old who already has a number of websites devoted to him, thanks to his role as the title character, starred in the BBC's 1999 production of David Copperfield and this year's spy flick The Tailor of Panama. What British producer David Heyman calls a "brutal" search for the right Harry ended only weeks before the film went into production in September 2000. "He had to embody so many qualities  vulnerability and strength, an inner life," says Heyman, who secured the movie rights for Warner Bros. for the bargain price of $700,000 before the books became a global phenomenon. (Tanya Seghatchian, a development executive in Heyman's company, read the first book after it was published in Britain and was moved to tears by the scene in which the orphaned Harry sees his dead parents for the first time in the Mirror of Erised  "Desire" spelled backward.) Columbus praises his young star's "tendency to play things so subtly," though some may wish he seemed a bit more rowdy, like the Harry in the books. At the same time, for fans of the novels, there will be much pleasure in seeing Sorcerer's Stone brought to the screen with all the attention to detail that a budget north of $125 million can buy. And those familiar with Columbus' previous work will be glad to know that he hasn't poured on too much sugar. Despite his solid box-office track record, Columbus, 43, wasn't a natural choice for the much-sought-after Potter job. Even Steven Spielberg was eyeing it at one point, envisioning a computer-animated film, like Toy Story, with Haley Joel Osment supplying Harry's voice. Rowling, says Warner Bros. Pictures chief Alan Horn, "hoped that whoever brought it to the big screen would not take it in a direction toward sappiness." Of all the directors in the running, including City of Angels' Brad Silberling and Dead Man Walking's Tim Robbins, Columbus had the sappiest rep after his most recent movies, Bicentennial Man and Stepmom. But he also had two Home Alone movies to his credit, which meant that he knew how to work with child actors. Another plus: earlier in his career, as a screenwriter, Columbus penned the wickedly subversive action comedy Gremlins, which was a hit for Warner Bros. in 1984. Columbus admits that as a director, "I was going down this soft, sentimental road...I'm the guy who wrote Gremlins. I tried to find something after I finished Bicentennial that would go back to that Gremlins area." Despite his A-list status in Hollywood, Columbus agreed to audition for the job by pitching himself to the studio. Heyman says Columbus was hired ultimately because of his "desire to be faithful to the material." Screenwriter Steve Kloves (Wonder Boys) also convinced the producers that he would respect the novels, and Heyman thought he would supply "a touch of melancholy, a little darkness, which I think is really vital to the story." 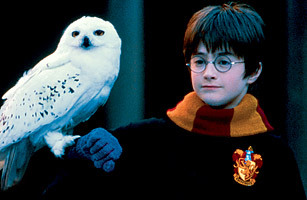 Some of the movie's most poetic moments come from Kloves' head: after his kindly headmaster, Dumbledore, gives Harry a moving lecture about letting go of his troubled past, the boy strolls out to the schoolyard and watches his pet owl, Hedwig, take a slow, symbolic flight. "Those are the moments that move you and elevate the movie beyond being just sort of a highlights reel," says Kloves. Still, the filmmakers have stayed remarkably close to the novel. "Jo (Rowling) had a tremendous influence," says Heyman. While the author didn't have final say over the movie, her contract gave her a consulting role, and she will receive a share of the profits. "When I optioned the book," says Heyman, who most recently produced the savagely dark 1999 cannibalism comedy Ravenous, "I made a promise to Jo that I wanted the film to be as faithful to her vision as possible. Her books work. That's the reason 100 million have been sold." Although she rarely visited the set, Rowling was involved during preproduction, when crucial design and plot decisions were being made. Columbus wondered early on where to put Harry's lightning-bolt scar, a souvenir from his infancy, when he had his first run-in with the evil Lord Voldemort, who killed his parents. Editions of the books all over the world showed the scar in various places, so the director went to the source. "I drew a face with a wizard hat, and I had her draw in the scar," says Columbus. She described it as "razor sharp" and drew it vertically down the right side of Harry's forehead. Rowling also had a hand in choosing most of the adult cast members. She specifically requested Coltrane. Others, like Richard Harris as Dumbledore, Maggie Smith as Professor McGonagall and Alan Rickman as Professor Snape came straight from a wish list of actors that Rowling provided the producers. She gave Rickman and Coltrane precious bits of information about their characters' futures. "There's an awful lot revealed about Hagrid in book five," says Coltrane, "and Jo thought it was important for me to know." Like what? "I could tell you," says Coltrane, "but then you'd have to die." While writing the screenplay, Kloves kept in touch with the author via e-mail. At one point he sought her advice on truncating the book's lengthy, entertaining but tangential chapter on Hagrid's pet dragon, Norbert. "I said, 'This chapter is killing me,'" recalls Kloves. "She e-mailed back, 'I'm glad to hear it, because it killed me too.' It's the one part of the book that she felt easily could be changed." Audiences will see Norbert hatch from his bowling ball-size egg and ignite Hagrid's beard with fire from his nostrils. But the book's subsequent sequence, in which a grownup Norbert is crated and carted away on broomsticks, alas, was never shot. Similarly, the Dursleys  Harry's awful Muggle relatives (Muggles are nonmagic folk)  get far less screen time than they did page space. Kloves also sought advice from Rowling on Quidditch, the broomstick sport at which Harry excels. "She gave me a little bit of a clue in saying that she likes American basketball," says Kloves, "so I understood some of what she was doing with hoops and things." But whereas Quidditch is played in a traditional stadium in the books, the movie's Quidditch games are played on an open field circled by towers, which accommodate the spectators and give the moviegoer a sense of height and speed as the players zip around them on brooms. Costume designer Judianna Makovsky (The Legend of Bagger Vance) initially based her Quidditch uniforms on the cover illustration for Scholastic Inc.'s American edition of Sorcerer's Stone: Harry in a modern-day rugby shirt, jeans and red cape. "It looked a mess," she says. "It wasn't very elegant." So she went on to outfit the Quidditch players in preppie sweaters and ties, 19th century fencing breeches and arm guards under their wizard robes. "There's no real period," she says of the film's costumes, which range from Elizabethan ruffs to tartan plaids to Dickensian frocks. Reasoning that Hogwarts would date back to the medieval era, production designer Stuart Craig (The English Patient) fashioned Hogwarts' Great Hall after England's greatest cathedrals. Like all the other sets, it was built at Leavesden Studios, a former airfield outside London. "The architecture is real," says Craig, "but pushed as much as we can, expanded as illogically huge as we can possibly make it." To save money, the producers initially asked Craig to find an existing old English street to double for Diagon Alley, where wands, owls, cauldrons, broomsticks and other magical paraphernalia are sold. This was a tall order, since the row of shops would be Harry's  and the audience's  first glimpse of the world of wizards. (Upon seeing it, wrote Rowling, "Harry wished he had about eight more eyes.") Craig ended up building his own awe-inspiring version  a long, highly stylized cobblestone street of Tudor, Georgian and Queen Anne architecture. "The buildings are leaning to the point where they would actually fall over," says Craig, "and you would never get that many styles jammed together." Today at Leavesden Studios, in a vast, drafty airplane hangar converted into makeshift soundstages, Diagon Alley is deserted. Hogwarts' magnificent staircase (partly constructed, then digitally finished onscreen) stands empty. But the lights will go on soon, as the sets will be recycled for Harry Potter and the Chamber of Secrets, which is scheduled for release next year, with Columbus back at the helm. The entire Sorcerer's Stone cast will return for Chamber of Secrets, and just last week it was announced that Kenneth Branagh will join them in the role of the vain new defense against the dark-arts teacher, Gilderoy Lockhart. Meanwhile, Kloves has begun adapting the third Potter book. The three young leads haven't yet signed on for any movies past the second, but because the Potter novels chronicle consecutive school terms at Hogwarts, the child actors could conceivably continue through what Rowling says will be seven books, aging right along with the franchise. "That would be cool," says the red-haired Grint, though he admits, "I don't know what I'll look like in a couple of years." He's not the only one worried about how the actors will age. "If they suddenly discover cheeseburgers on movie three," says Columbus, "I don't know what I'm gonna do." Other concerns will arise as the movies progress. The PG-rated Sorcerer's Stone is designed for kids ages six and older, but Rowling's books do get scarier. They also get longer. Columbus has already come up with a strategy for the very thick Goblet of Fire, which could hit screens in 2004. "I think it has to be two movies," he says. "We could shoot a four- or five-hour version, release part one at Thanksgiving and part two at Christmas." Otherwise, Columbus is keeping mum on his Potter plans, and a veil of secrecy is descending on the second movie. On Columbus' office wall at Leavesden, he has tacked up renderings and scene sketches from Chamber of Secrets. He kindly asks the visiting journalist to ignore them. Too late. It's a car  a drawing of the magically souped-up Ford Anglia that carries Harry and Ron to their second year at Hogwarts. It's turquoise, just as Rowling described it, and already in flight.